It has been commonplace to believe that hunter-gatherers had good tooth health and that it was farming what caused dental problems because as cereals became a staple. There was good reason for that: caries were detected only rarely among hunter-gatherer remains (0-14%) while early farmers had much such painful problems much more frequently. However the Upper Paleolithic people of Taforalt caves (Rif, North Africa), some 14,000 years ago (Oranian culture), had caries in 51% of adult teeth, a frequency comparable to those of early farmers. This is attributed to the very high levels of nut consumptions, particularly acorns but also pine nuts, juniper berries, pistachios and wild oats. The number of acorn remains found is so large that the archaeologists had to conclude that they were used as year-long staple. Taforalt people had hand mills, which they used to process some of these nuts, most likely the acorns, whose consumption as bread has been documented since antiquity. 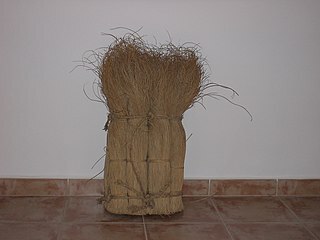 Another finding are esparto grasses, which the authors believe were used in basketry. However I must mention that this versatile fiber has known many uses, being documented in Neolithic clothing of nearby Andalusia, used for some types of shoes even today and, of course, being a prime material for rope-making. Oranian culture dates to c. 22,000 years ago, with likely (partial?) roots in the Southern Iberian Gravetto-Solutrean (hence the name Iberomaurusian, although the culture as such is not known in Iberia). It was replaced in the Epipaleolithic by Capsian culture, with ultimate roots at the Nile (and hence the most likely vector of Afroasiatic languages leading to Tamazigh, aka Berber). A premise of Primitivism, which is not really a doctrine or philosophy but more like realistic approach to the human condition, is that our evolutionary past is shaped almost totally by hunter-gathering. That we are basically hunter-gatherers in a jump or maybe formal suit. Why? Because some 95% of the biological history of Homo sapiens, as a formed species is one of hunter-gathering, not of productive economy nor civilization. This percentage can be extended to maybe 99.5% if we consider the whole history of the genus homo, etc. And that is a lot. Do I digress? Well, maybe not so much after all. The evolutionary news today is in any case that the bacterial ecosystems in our mouths have been degenerating since Neolithic, and then again with Industrialization. As Not exactly rocket science (a National Geographic blog written by Ed Yong) explains the bacteria in our mouth is not all hostile but, at least for hunter-gatherers, often balanced: some bacteria may attack our teeth but then others protect and even repair them. Much like the better known bacteria of our guts, there is a general balance in which, naturally at least, symbiosis with the human needs tends to dominate. After all those bacteria live in our mouths and therefore need it to exist in good shape: they may not be exactly “aware” of their own needs or the benefits of harm they bring to us but evolution fixes it in the long run, of course. Epipaleolithic foragers from Poland with a rather thick plaque, plaque that retained in millennial hibernation the bacteria of their mouth, have provided evidence of Prehistoric hunter-gatherers having a healthy, balanced mouth bacterial ecology. Instead Medieval English, who were already eating many carbohydrates from cereals, illustrate with their plaque the beginning of mouth bacterial decadence. There are a total of 34 studied remains between these two dates, illustrating that this change happened exactly with the Neolithic Revolution. The members of the modern research team used their own mouths as reference for the modern bacterial environment. The results were rather depressing: industrialization has created many refined, unbalanced, foods (white cereals and sugar especially) that cause our mouths to be the boon of dentists. A similar kind of bacterial ecology decadence was observed in a previous study between the guts of Burkinabe farmers’ children and those of Italian urban ones. The latter have ecosystems dominated by well-fed firmicutes, associated to obesity. Beets and acorns is the real paleofood… or at least part of it. contrary to the modern definition of the Paleolithic, or Stone Age diet. one of today’s hottest health trends: the paleo diet. have access to bread, rice or pasta. But is it true that Stone Age hunters and gatherers didn’t eat any carbohydrates at all? carbs when the opportunity presented itself. … continue reading at Science Nordic. Besides sequencing this individual’s ancient DNA, the study focuses on discerning the earliest stable occupation of the island and the diet of its inhabitants. The authors argue that this occupation of Sicily could be the oldest stable one and that it happened because of the formation of a land bridge because of low sea levels soon after the Last Glacial Maximum (but actual bathymetries hardly support such land bridge, so soon after the LGM they needed boats again to cross the dangerous Strait of Messina). However some Aurignacian artifacts are known and believed to be of older chronology. They also argue that, based on the N/C isotopic ratios, these peoples had a mostly carnivore land-based diet. This leaves me quite perplex because the Nitrogen-15 values are much higher than those of foxes (a mostly carnivore animal) and that is usually considered a signature of feeding off sea mammals. Figure 3. Carbon and nitrogen isotope composition of bone collagen from Mesolithic humans and fauna of Grotta d’Oriente. See also: Magdalenians did eat sea mammals (at my old discontinued blog Leherensuge). The headlines and even contents in commercial media and blogs alike are all about meat eating (much of which must be blamed on the lead researcher himself, who seems to have a bias) but it does not need to be the reason at all and rather reflects an ideological bias. All that paleoanthroplogists have detected is a folate deficiency in a fragment of a skull of what is probably an Homo erectus/ergaster young child (est. 2 y.o. or less) from East Africa. There is no dietary isotope research that can confirm or deny the meat hypothesis. Figure 3. Ectocranial (top right) and endocranial (top left) close-up views of the OH 81 fossil, accompanied by magnifications of the porotic hyperostosis paleopathology as observed ectocranially (lower left) and edge-on at the diploic-table junction (lower right). They conclude that this porosity of the bone, known as porotic hyperostosis, should indicate folate deficiency (in which vitamins B9 and B12 are involved) caused by malnutrition. They also argue that weaning may have been a cause because, at least in other contexts, it is a key period for nutritional illnesses, often implying B12 deficiency. The archaeo-environmental context (persistent drought) may have contributed to this illness and death as well. The presence of anemia-induced porotic hypertostosis on the 1.5 Ma OH 81 hominin parietal, indicates indirectly that by at least the early Pleistocene meat had become so essential to proper hominin functioning that its paucity or lack led to deleterious pathological conditions. Were do we get that from, Dr. Domínguez? Some sort of nutritional lack seems obvious but there are many reasons why folate deficiency can develop; for example excess of solar radiation (it has been proposed that the ancestral dark skin of humans serves to prevent folate loss, rather than cancer, which only develops in the long term). Was this child an albino maybe? Or had it celiac disease (another possible cause of malabsorption)? And (update), as the Subersive Archaeologist discusses rather emotionally, the maybe simplest explanation: that malaria could be the cause is dismissed in the paper without satisfactory explanation. Sure thing that lack of sufficient animal protein intake is a plausible cause but by no means demonstrated. An isotopic analysis could support or reject this hypothesis, although I am uncertain if it is possible to perform on this particular bone. See also labels Paleolithic food, human evolution and pigmentation in this blog. Long chain polyunsaturated fatty acids (LC-PUFAs) are essential for brain structure, development, and function, and adequate dietary quantities of LC-PUFAs are thought to have been necessary for both brain expansion and the increase in brain complexity observed during modern human evolution. Previous studies conducted in largely European populations suggest that humans have limited capacity to synthesize brain LC-PUFAs such as docosahexaenoic acid (DHA) from plant-based medium chain (MC) PUFAs due to limited desaturase activity. Population-based differences in LC-PUFA levels and their product-to-substrate ratios can, in part, be explained by polymorphisms in the fatty acid desaturase (FADS) gene cluster, which have been associated with increased conversion of MC-PUFAs to LC-PUFAs. Here, we show evidence that these high efficiency converter alleles in the FADS gene cluster were likely driven to near fixation in African populations by positive selection ~85 kya. We hypothesize that selection at FADS variants, which increase LC-PUFA synthesis from plant-based MC-PUFAs, played an important role in allowing African populations obligatorily tethered to marine sources for LC-PUFAs in isolated geographic regions, to rapidly expand throughout the African continent 60–80 kya. I will also remain skeptic of the fact, which is implied by the study, of a primitive vegetarian or almost vegetarian diet of Homo sapiens in Africa: I do not think that such an a priori claim can stand at all. The same logic that applies in Africa should apply in Eurasia-plus but the fact is that Eurasians retain the ancestral allele and related genetic bloc without obvious damage to the brains. There should be another explanation therefore: for example a founder effect at the Eurasian initial “out-of-Africa” bottleneck after a process of near fixation at previous, or maybe even adaptive introgression from Neanderthals in this aspect. Studies suggest that anatomically modern humans arose in Africa approximately 150 thousand years ago (kya), expanded throughout Africa ~60–80 kya, and to most parts of Europe and Asia ~40 kya–. A paper that insists in such an obvious error should never pass the peer-review process, in my not-so-humble opinion. Even if we ignore the absurdity of this molecular-clock-o-logic pseudoscientific insistence, and accept that we have to double or more than double the age estimates to be back into the common sense zone, or better, just ignore them altogether, we still have the problem of why would the allele and the whole genetic block around it be almost fixated in Africa but not at all in that African-derived subset that is Eurasia and the smaller continents. Figure 3. Geographic distribution of derived allele frequencies in a 100 kb region surrounding rs174537 in the 52 populations represented in the Human Genome Diversity Panel Data. Panel A represents physical position of the SNPs relative to genes in the region, Panel B is SNP name (derived allele), Panel C is frequency of derived allele (in orange) in the populations clustered based on geography, Panel D is an indication of the allele associated with increased LC-PUFA metabolism in published association studies, and Panel E is the detailed overview of rs174537 showing is near fixation within Africa. SNPedia reports slightly less dramatic levels of fixation in Africa for rs174537 itself but nothing that is too important. So we do have a clear case of an allele that has been selected for in Africa but, crucially, not elsewhere. How can this have happened in Africa prior to the migration out of Africa, as the authors claim, but not affect that African subset that was the migrant “out of Africa” population, whose formation necessarily happened after the African expansion and close to the overall origin(s) of that African expansion? If the fixated allele is so important for brain function how is it that many Eurasians-plus, who lack the allele are not plainly dumb? How did they survive along time? Do the authors have any archaeological evidence that vegetarian sources of food, notably oils, were so extremely important in African Middle Paleolithic (Middle Stone Age)? I do not think so, not at all. How do the authors explain the lack of selection for this allele in South Asia, a region where total or almost total vegetarianism (dairies excepted) has been very common for many millennia. How do the authors explain the lack of selection out of Africa or even what would seem to be a tendency for the opposite selection trend in parts of East Asia and Native America? Actually the only well known adaptive role of this SNP is that it protects against cholesterol but not the allele that appears to have been selected in Africa but the “blue bloc” that survived out if it (and may have been selected for in some regions, speculatively). TT homozygotes, and only them, have lower LDL-C and total cholesterol.These are only truly common among SE Asians and Native Americans (or Mestizos). So what do we make of this? In truth no idea: the authors hypothesis is there but I fail to find merit in most of it. It may be just a matter of refinement of the original hypothesis however – your take.